During Eidul Azha, Muslims venerate Prophet Ibrahim’s (PBUH) utter submission to God, in his willingness to sacrifice his son, Hazrat Ismail (AS), when he was commanded to do so. The “Festival of Sacrifice” is, indeed, a celebration of Prophet Ibrahim’s (PBUH) steadfastness in his faith, as well as, an occasion for Muslims to renew their resolve to follow his tradition. Thus, Muslims sacrifice an animal on Eidul Azha. The sacrifice is commemorated by sharing one-third of the meat with the poor, while the rest of it goes to the holiday feast. That’s what the adults are concerned with. Children have always had the luxury to live out-beyond the burden of the tradition. Eidul Azha, for children, is the Greater Eid and a completely different story; a story that is filled with visiting the bakra mandi (cattle market), bringing a good-looking animal home, giving it a bath, embellishing it with stunning designs using mehndi, introducing the animal to friends and neighbours, bringing fodder ritualistically on a daily basis and finally discovering an emotional bond with the bakra (goat) on the Eid day, leading to heart-searing pleas to the parents during qurbaani (sacrifice) time. 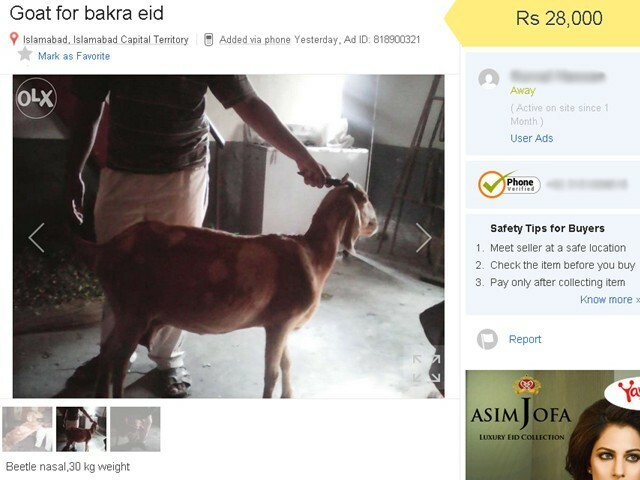 In short, instead of Eidi, chooriyan, and mehndi, the Greater Eid is all about the bakra. I remember accompanying my father as an overjoyed kid to the cattle market. It was something I loved to do even after the most tiring day at school. Eidul Fitr, or the ‘choti’ Eid, had its own charm, but there was nothing like Bakra Eid; there was no better festival than the bakra mandi. It was fun seeing a thousand different animals in one place. It used to become a dilemma in itself – which one to buy and which one to leave. If it was left to me, I would have loved to take all of them home like any other kid. But Baba, like other parents, was concerned with the adult version of Eid. But still I got to choose the bakra. Often, my father and I would spend a ridiculous amount of time discussing the nitty-gritty details of a good bakra. This would lead to taking a round of the whole bakra mandi and narrowing down options based on height, features, colour, weight, and above all, their teeth! It also led to surveying sacrificial animals bought by friends and relatives which ranged between goats, lambs and calves. Researching was fun but nights used to get restless. There used to be so many options, equally alluring, making it difficult to make the definitive decisions. My dreams were filled with goats and lambs, of all heights and colours, bleating all around. I look back and think that a child’s first love could be a bakra, perhaps. I mean there was nothing we would not do to make it look the best in the town, from cleaning its living space, bringing fodder, applying mehndi on it, adorning it with garlands of multi-coloured threads, and taking it out for walks around the vicinity, with puffed chests and a sense of accomplishment. Well, life is transitory. All good things come to an end, and so does childhood. We look back and find out that childhood and bakra Eid left together on the same train, never to return. We, on the other hand, find ourselves in the shoes of our parents, holding a young hand, roaming around the bakra mandi, looking for the right bakra and our long-gone childhood, perhaps. We can’t bring back the childhood, but we do our utmost, despite the burgeoning inflation, to bring young kids a sacrificial animal to allow them the luxury of celebrating the Greater Eid, beyond the burden of tradition. 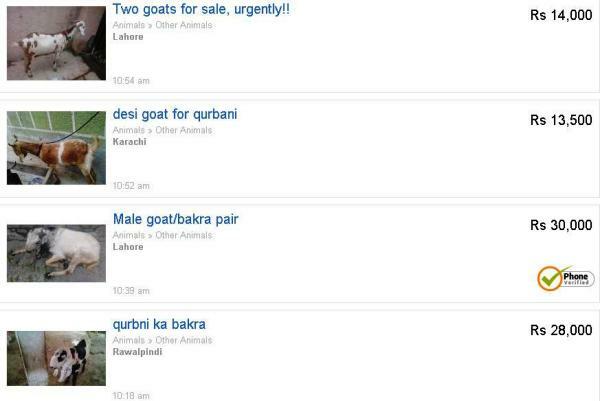 Today, however, purchasing a bakra is not as old fashioned as it used to be. Buying a sacrificial animal, like many other things around us, has been mechanised. 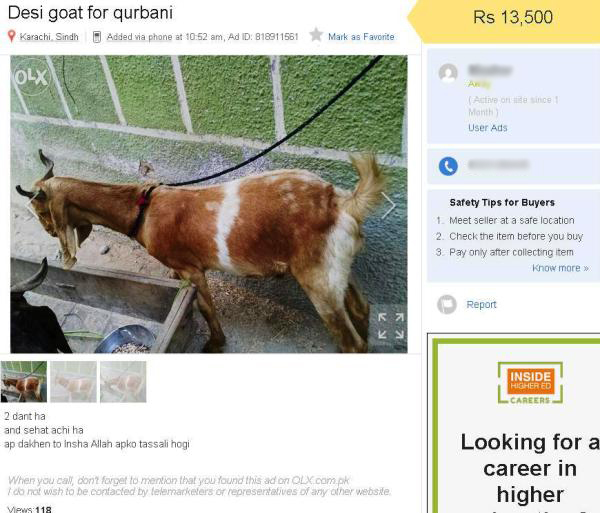 Now one can buy a bakra online by looking at photographs on online portals, which are uploaded for the customers, just like second-hand furniture and cars. It is delivered at your doorstep, as and when desired. It saves you time and a whole lot of hassle. It allows you the luxury to buy your bakra in the comfort of your home. However, online bakra shopping could be relatively more expensive. The portals compensate for it by offering free delivery and butcher services. For the busy urbanites, these offers are a God-send. It is true that e-commerce has made our lives comfortable and hassle free. The online portals save customers from going through traffic jams, enduring the stench of cows, goats and stacks of hay. The downside is that an online shopper does not go through the enriching experience of bakra shopping. There is no denying the fact that electronic commerce and its allied activities over the internet are the engines of economic well-being. But to what end? You know how it goes on the internet – You want to see as many photographs as possible, to make sense out of the virtual market. You start looking into the various breeds and types of animals to explore the ones not available in your country. After going through numerous entries and looking at dozens of photographs, you want to know how much a particular sacrificial animal would cost if you go to the bakra mandi. You call up your friends and relatives to inquire. Eventually, you are not so sure whether you should shop online or visit the nearby bakra mandi. Pressed by time, you make a decision which isn’t, perhaps, the best decision. Remember, Eidul Azha is the commemoration of Prophet Ibrahim’s (PBUH) sacrifice for you. For your offspring, it’s more than that; it is not just slaughtering the animal in the will of God, it is a cherished childhood experience. It is about going through the smells of goats and cows in the air; it is about having real conversations and sharing a part of our hearts and minds with others. This Eid, I hope every child in Pakistan is able to create beautiful memories. Although I fully appreciate where you are coming from…..but doesn’t religion and progress go hand in hand ?